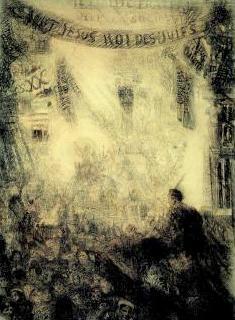 It is generally acknowleged that James Ensor was one of the key figures and pioneers of Modern Art. During his lifetime, his residence in Ostend was a meeting place for artists and intellectuals. The Museum of Fine Arts Ghent (MSK Ghent) and the S.M.A.K. join together to examine the relationship between the visionary art of James Ensor and the artistic praxis of a series of contemporary artists with the exhibition Hareng Saur: Ensor and Contemporary Art. Ensor‘s oeuvre contains a number of themes that are also important for contemporary artists: the mask, the grotesque, the self-portrait and social criticism. The exhibition approaches Ensor as if he were a contemporary artist and will investigate relationships, dialogs and links between the versatile oeuvre of Ensor and that of his contemporary colleagues. In addition to more than 100 works by James Ensor (paintings, drawings and graphics) from public and private collections, there will be works to be seen by others such as: Asger Jorn, Georg Condo, Javier Tellez, Ely Strik, Cindy Sherman, Jake and Dinos Chapman, Guillaume Bijl and Paul McCarthy.